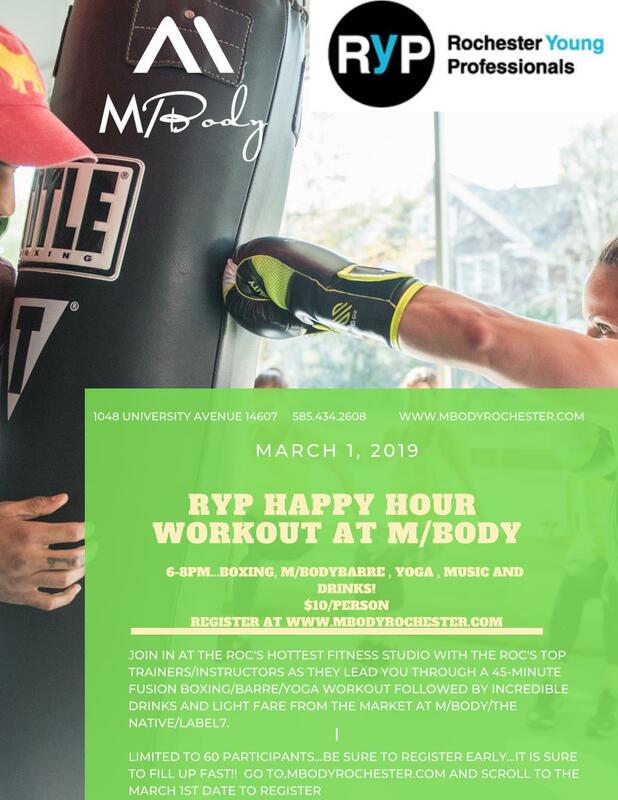 RYP HappyHourWorkout | Rochester Young Professionals, Inc.
JOIN IN AT THE ROC’S HOTTEST FITNESS STUDIO WITH THE ROC’S TOP TRAINERS/INSTRUCTORS AS THEY LEAD YOU THROUGH A 45-MINUTE FUSION BOXING/BARRE/YOGA WORKOUT FOLLOWED BY INCREDIBLE DRINKS AND LIGHT FARE FROM THE MARKET AT M/BODY/THE NATIVE/LABEL7. You will also have a chance to sign up early for this year’s Running o’ the Green with Rochester Running Company!! We will be having green giveaways all night and killer music to launch the greatest month of the year in the ROC! !